When screws are missing from the upper bunk's guardrails, the vertical slats on the guardrails can detach and pose the risk of children falling when getting in or out of the upper bunk. This recall involves about 750 Cottage bunk beds, which can be configured as bunk beds or as twin beds. 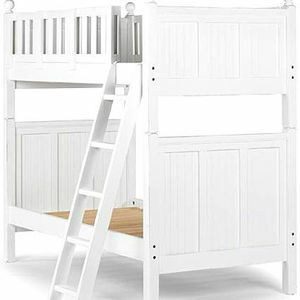 The assembled bunk bed dimensions are 81 1/2 inches (length) by 43 1/2 inches (width) by 74 1/2 inches (height). The beds were sold in both white (model numbers 236-519 and 188-174) and pine/honey finishes (model numbers 459-410 and 172-596) and included a long and a short upper bunk guardrail, each of which should be secured to the inside of the upper bunk bed's side rail with screws. Stickers bearing the model numbers are located on the inside of the lower bunk headboard. The Land of Nod catalog, Web site www.landofnod.com, and at The Land of Nod stores in Illinois and Washington state from January 2006 through January 2009 for about $1,100. Check that all screws that attach the guardrails to the upper bunk have been installed. If the screws have not been installed, stop using the beds as a bunk bed immediately and contact The Land of Nod to receive new screws free of charge. All known purchasers have been notified of the recall. For more information, contact The Land of Nod at (800) 933-9904, 8:30 a.m. to 5 p.m. CT, Monday through Friday.